Here's an introduction to Les Hipple and his stringent training rules, taken from the book, "A Coach's Life." Hipple, thirty-two, has just taken over the reigns at Marion High School in Iowa. The Marion Indians of 1945 discovered that Hipple did not yell much. He never cursed at his players are punched or kicked them as his predecessor had. He sometimes growled. He fumed when his players did not live up to his expectations, but his emotions was transmitted not in a scream, but in a grimace, a head shake, or a cold stare. Some said his lips trembled when he was really angry. He governed his players not so much with words as with gestures, postures, and facial expressions. His glare was so icy it could freeze a boy in his tracks. Hipple had, as other players have said about their coaches, "God-like tendencies," super-human powers of observation, the ability to see what was in their hearts, and judgment that was as immediate and ruthless as it was fair. Some players over the years feared him. A few saw a twinkle in his eye or sensed subterranean warmth under his severity, but they were a minority. Most of his players regarded him with fear-tinged awe. He was deadly serious about what he was doing. Whatever was going on here, it wasn't just a game. Hipple outdistanced most great coaches in one respect, however: He repeatedly turned out championship teams in four different sports--football, basketball, track, and cross-country. He was elected to both the Iowa Football and Basketball Coaches Halls of Fame, an honor he shares with only a few other men. When Hipple started coaching, multi-sport head coaches were fairly common at small schools, but when he stopped coaching thirty years later, they were rare. His commitment, his love of coaching, his versatility, and his sheer stamina set him apart from all but a very few coaches. His rules made him unique. 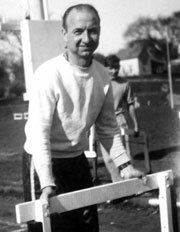 Over the years, they became the most significant aspect of his coaching reputation. Eventually, he was known all over the state as much for his rules as his victories, and since his rules were often a matter of rumor rather than fact, his reputation for fearsomeness grew far beyond reality. With the onset of the 1945 football season at Marion, he introduced his rules to players and parents who had been accustomed to a casual approach to sports. "Hipple told all the players to bring their parents to the school for a meeting," recalled John Vernon, a junior that year. "He handed out the rules and read them aloud, and all of us, parents and players alike, had to agree to abide by them. It was kind of like joining the military. You take a step forward, make a pledge and you're in, for better or worse." We may not drive cars except on Sundays during specified times. We will not miss practice. If for any reason you cannot attend practice, you must receive permission ahead of time. "You, as a Marion Indian, cannot do some of the things other students do," Hipple wrote. "If you think more of smoking, drinking, dating or going steady, staying out late at night, or riding around in automobiles, then you are not willing to 'pay the price' and it is best for you not to take out a uniform . . . To be on a championship team you have to be a champion yourself.